Both Big Cat Textiles in Newburgh, Fife and Hat in the Cat in Perth are well placed for the dramatic scenery of highland Perthshire, the Angus Glens and the charming beaches and villages of the Fife coast. There is a superb choice of golf courses within striking distance including famous courses at St Andrews, Carnoustie and Gleneagles. The rivers Tay and Earn are popular for salmon and sea trout fishing and there are numerous opportunities for shooting and stalking. Families can also enjoy the paths and cycle tracks in the nearby Pitmedden Forest and sailing clubs in Newburgh, Broughty Ferry and the East Neuk villages, not to mention the water sports available on inland lochs. Why not make a holiday of it! There is a regular bus service from Perth and Cupar to Newburgh. Free parking is available in the car park next to the bowling green. There are two disabled parking spaces adjacent to the venue. 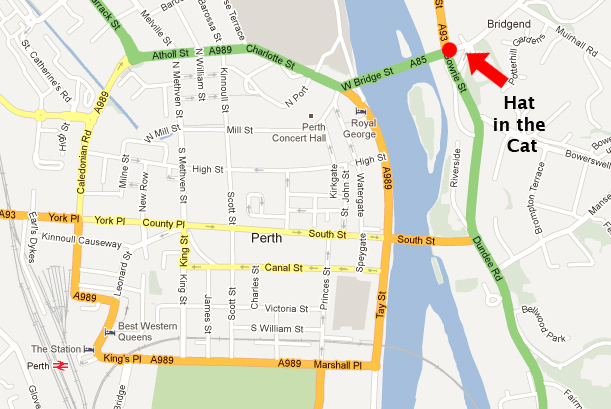 Hat in the Cat is in Bridgend, Perth, a 15 minute walk from the bus and train stations. Parking is available in the car park diagonally opposite for a maximum of 2 hours, or there is unlimited free parking up the hill near Murray Royal Hospital.